The new bar/restaurant at F-Pier welcomes travellers passing through Schiphol airport from all time zones and corners of the world. Inspired by the movement of both people and celestial bodies across the sky, Moods caters for all types of passengers, whether they are grabbing an early breakfast or enjoying a late-night drink. The design concept compares travellers from different time zones and destinations, all having their own unique biorhythms, to natural phenomena of Moon and Sun travelling in their own rhythms. While for some passenger the time zone they are currently in is the one in which they comfortably live, for others early morning at the airport is their natural time for winding down after a long day. At Schiphol all those travellers come together, their biorhythms overlapping, just like the journeys of the Sun and the Moon overlap occasionally, creating eclipses. Taking the continuous rhythm of nature even further, Studio Modijefsky categorised travellers as early birds and night owls. Mood’s material palette mimics natural habitats of each of these groups - dark heart of the forest, inhabited by nocturnal creatures, transitions gently into a colourful, open field – perfect for early risers. Grey and green natural stones and reflective materials surrounded by wood replicate rays of light shining through the leaves, creating playful shadows in the forest. Light greens used for custom banquet sitting and loose furniture pieces spread throughout space, creating an impression of ferns and grasses on the outer edge of the woods. Shades of green, yellow and pastel tones represent the diverse flora of the forest with brighter accents appearing throughout the interior like wild blossom. The beauty of nature is also referenced in the design of the bar. 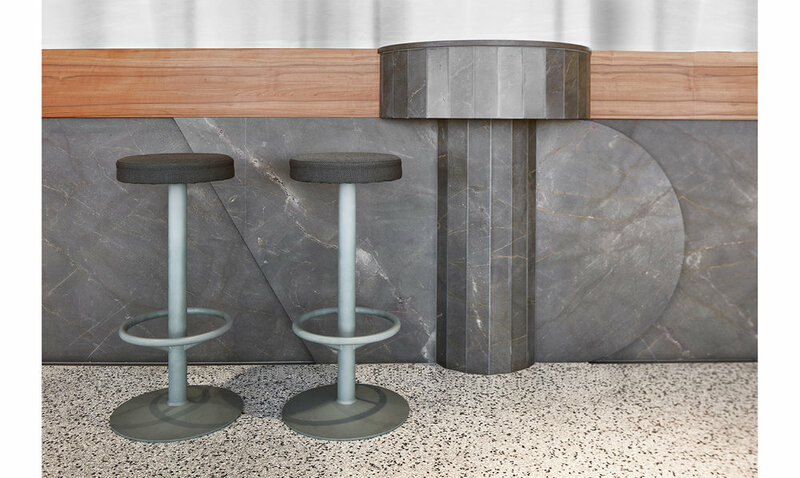 Round, faceted marble shapes inspired by bark covered tree trunks attach to the main wooden finish, adding functions and dividing bar’s surface. 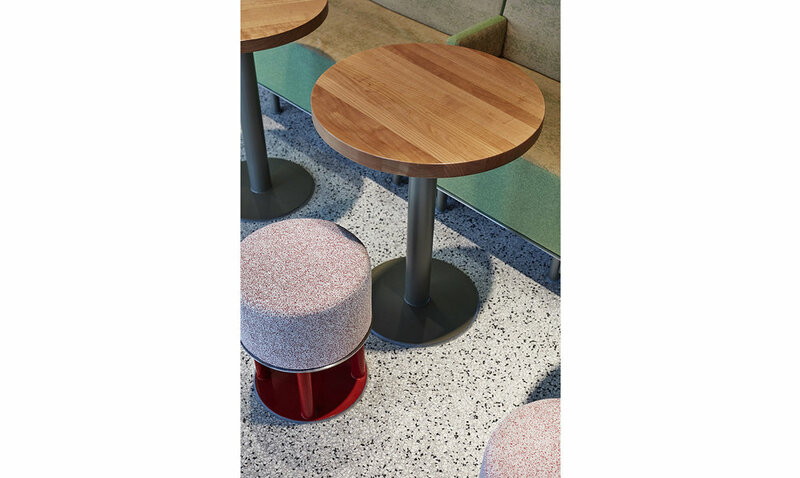 Tables of various heights rise above curved seating, their bright red accents popping up like rare flowers. The extensive use of natural textures such as wood, stone, cork and woven wool fabrics, emphasizes the natural habitat theme, giving a warm and inviting feel to the space. 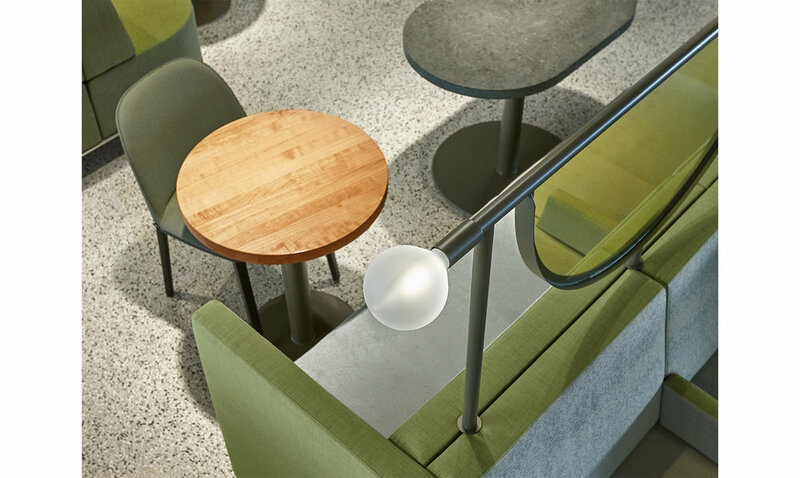 Several types of high and low seating divide space into lounge, bar and restaurant areas, creating perfect environment for all guests to find comfort in. The space is designed to serve solo travellers as well as couples and groups, creating a platform to share food and travel stories. Inspired by the lunar phases, circle shaped elements play with natural and artificial light, blocking it or filtering into different colours, creating varied mood zones. All textures and materials of furniture pieces awaken the senses while at the same time putting travellers at ease. Custom made light elements combined with transparent round forms are an integral part of the seating. Their design once again recalls the theme of lunar phases. 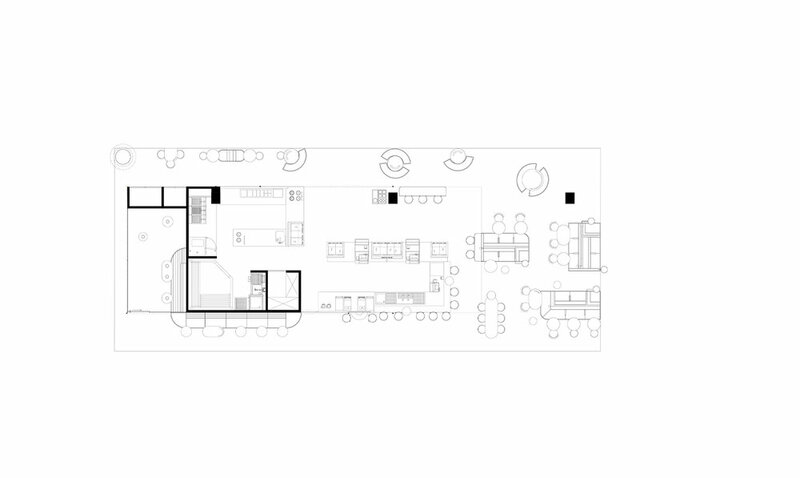 The logo and graphic identity, also designed by Studio Modijefsky, compliment the design of the interior. Moods’ sign, resembling the Sun in eclipse, appears in different finishes on glass, tiles and wood throughout the interior. 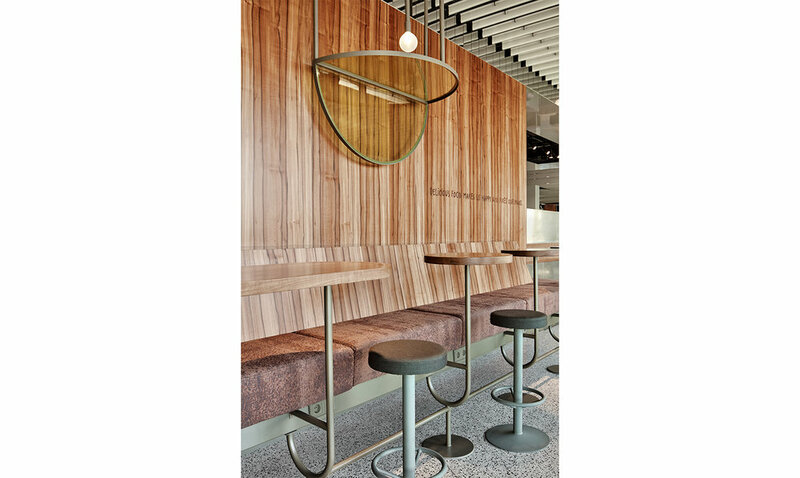 In the hectic atmosphere of Schiphol airport, Moods’ poetic references to natural phenomena create a calming space for all travellers to drop in, quench their thirst, feed their hunger and fly away.